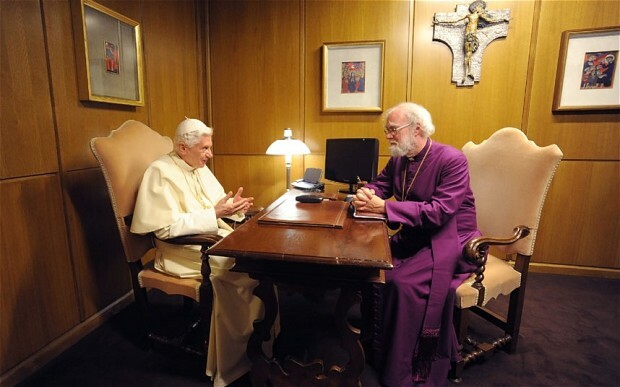 Rowan Williams spoke to some Catholic Bishops at the invitation of an unusually reconciliatory Pope Benedict. The meeting focussed on how the Church might be more relevant to an increasingly secular world. “To put it boldly, contemplation is the only ultimate answer to the unreal and insane world that our financial systems and our advertising culture and our chaotic and unexamined emotions encourage us to inhabit,” he said. “Having seen at first hand, in Anglican schools in Britain, how warmly young children can respond to the invitation offered by meditation in this tradition, I believe its potential for introducing young people to the depths of our faith to be very great indeed.” Dr Williams added that for adults who had “drifted away” from regular attendance at Church, the style of worship practised in places such as Taizé could offer a “way back”. What do you think? Can developing a contemplative life really have such a transformational effect on the next generation? Can you really inculcate the practice of spiritual contemplation at an early age in this way? This entry was posted in meditation and tagged Archbishop of Canterbury, contemplation, Pope, Rowan Williams by Chris Goan. Bookmark the permalink. It’s been a practice in Townsville , Queensland for sometime now in schools, teaching children to meditate. Interesting! I wonder what long term effects it will have then? Sure, why not? Just as the head of my son’s Anglican primary School pointed out to me, when I die, The Lord won’t be asking about whether I was a Catholic or a Prod, but if I believe in he redeeming power of the Holy Spirit. Without getting into a tussle about the Holy Trinity, I think this mindset can work for anyone, of any Religion and to promote 5 minutes of peace and ‘listening’ to children and adults alike per day can only be a good thing in an increasingly noisy and clamouring world….thanks for the thought, and also do we yet know how far Richard Dawkins has got with his ‘shock’ agreement to be a bit nicer to us religious freaks, with the Jewish Rabi on telly the other week? Chuckle- I did not see it, but I suspect he is realising that aggressive snootyness does his cause no good so has been told to soften up- a bit like ‘Compassionate Conservatism’ from this years Tory party conference!